Dominant seventh chord in the major scale contains diminished triad of the seventh? The seventh chord built on the fifth step of the scale (the dominant seventh) is the only dominant seventh chord available in the major scale: it contains all three notes of the diminished triad of the seventh and is frequently used as a stronger substitute for it. What does this mean, especially "diminished triad of the seventh"? "Dominant seventh" is a shorthand for what others call a "major-minor seventh," meaning a major triad with a minor seventh on top. 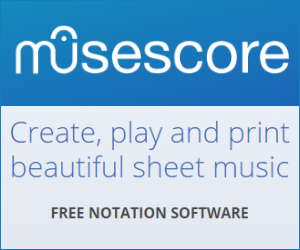 If we take all notes of a major scale and create seventh chords on top of them using only the notes of that major scale, only one of these seventh chords will be a major-minor ("dominant") seventh: that built on scale-degree 5 of the major scale. Scale-degree 5 is called the "dominant," hence the term "dominant seventh." When this text says "diminished triad of the seventh," the writer is being a little loose with their terminology. It should say "diminished triad of the seventh scale degree," because the triad built on top of that seventh scale degree is a diminished triad. And that same diminished triad is the third, fifth, and seventh of the dominant seventh chord built on scale-degree 5. In C major, scale-degree 5 is G and scale-degree 7 is B. The seventh chord on G is G B D F (a major triad G B D with a minor seventh G F), and it includes the diminished triad built on scale-degree 7: B D F.
We call the resolution stronger because the V7 chord is much more directional (the vii°7 chord, which would be the diminished seventh chord, is symmetrical and ambiguous). There are other reasons, and as further reading, this post does a good job explaining this resolution's strengths. 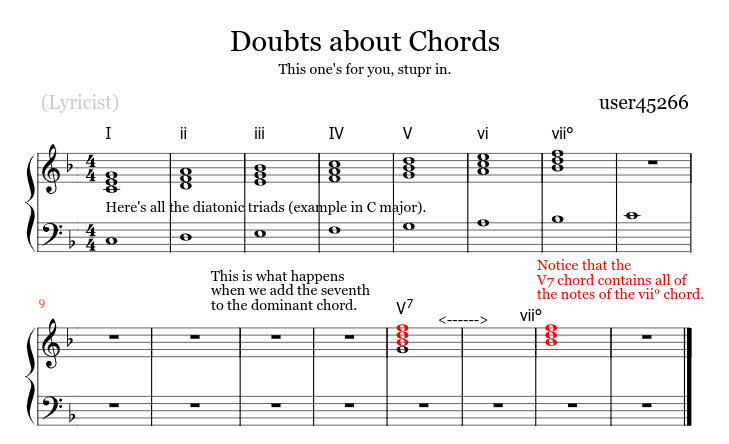 I won't explain much of chord theory since it seems clear that you are looking into theory on your own. however, I will explain what is written in the snippet that you posted in your question. "The seventh chord built on the fifth step of the scale (the dominant seventh)"
it is referring to the diatonic seventh chord derived from the 5th note of your major scale. Diatonic seventh chord means the chord has the triad plus the seventh note which is in the scale. For example - in the case of C major scale, the fifth of C is G. Now let's try forming the seventh chord (remember the seventh chord is basically the triad plus the 7th note from the initial note.). G triad in C major is a major chord - G-B-D. the diatonic ( in scale ) seventh from G is F. So your seventh chord built on the fifth step of C major is G-B-D-F. This chord is known as a dominant seventh chord and is denoted as (roman numeral)7. "is the only dominant seventh available on the major scale"
and what the above line meant was that you can only make a dominant 7th chord from the 5th note of the major scale within the scale. Taking any other note and making the seventh chord from that note won't be a Dominant seventh. "it contains all three notes of the diminished triad of the seventh and is frequently used as a stronger substitute for it"
the diminished triad of the seventh means the chord root of which is the seventh note of the scale. So in the case of C major scale, it will be a B diminished chord. The notes of B dim are - B,D,F . . . Seems familiar? It has almost all the notes from G7 or "the seventh chord made from fifth step". Since it has almost all the notes from Bdim, it is often times used as a substitute of the diminished chord. Dexter Nair is a new contributor to this site. Take care in asking for clarification, commenting, and answering. Check out our Code of Conduct. Every note in a major scale can have a triad built on it, as shown in user45266's answer. But here, we're talking about seventh chords, which not only have 1,3 and 5, but a diatonic 7 too. As in (key C) - C E G B. D F A C. E G B D. F A C E. G B D F. A C E G. B D F A. The bold letters are the chord names, and each is called 7th. C and F become maj7, D, E and A become min7, leaving the chords from the question. The only dominant chord is that based on G, which also happens to contain the triad made from the 7th note of the scale - B. That chord - B D F is diminished, and as such, points in no particular direction, neither major nor minor, so is weak in comparison. However, when it's combined with the dominant note of key C (G), it takes on a far more defining role, pushing towards the root C. Incidentally, adding that extra note to Bo gives B D F A, known as Bm7&flat;5. Not the answer you're looking for? Browse other questions tagged theory chords harmony chord-theory or ask your own question. Can any diminished chord be used as V anywhere? Why do many songs in major keys use a bVII chord? Why do we only build 7th chords on the supertonic and dominant of a major scale? Is a seventh chord as fundamental as a triad? Is this chord in Für Elise an example of a diminished seventh chord in classical music? Am I right in that it is a diminished triad without the third?